This cue ball is engraved with a red circle. Many people perceive the quality of this ball being higher than that of our plain white replacement cue ball, but that is just not true. 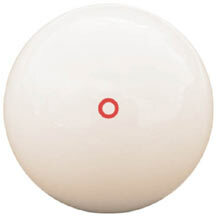 One advantage of the red circle cue ball is that it makes a great practice ball. You can use the circle as a target, and then compare your chalk mark with the position of the circle to see if you indeed stroke properly and hit the cue ball where you intended. The ball is regulation 2-1/4" in diameter and is regulation weight.